Best known for its James Bond appearance with its JB007 private plates , the DB5 is a GT luxury car produced between 1963 and 1965. Standard coupe came with 3,995 cc inline six cylinder engine producing 282 bhp at 5,500 rpm and 288 lb·ft at 3,850 rpm. Top speed was measured at 143 mph and 0 to 60 mph acceleration was rated at aprox. 8 seconds. 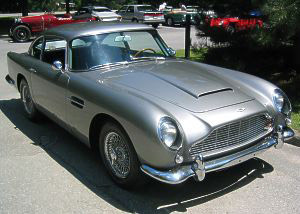 Later in 1964 DB5 Vantage was introduced. This spicy version produced 315 bhp. Only 123 convertibles were made and sold.